This is an open air experiment. 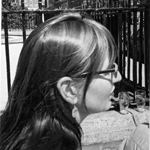 A poet and Librarian, KIM MINKUS is also a PhD candidate in the English Department at Simon Fraser University, where she is specializing in contemporary poetics. In April of 2006 Kim was awarded a fellowship to King's College London. Her latest review appears in the online journal Jacket 28 and she has poems forthcoming in the journal West Coast Line.